Education is about looking both into the past and into the future, which is why it also has two opposite purposes: to ensure cultural progression and to prepare students for their unknown future. Modern educational theory and practice are built on the premise of education being the process for students to “develop their rational faculties so that they become capable of independent judgement”(1). This requires for students to engage in three-dimensional learning process and grow their skills, knowledge and understanding. It is important for every teacher to know the values and ideas behind the instructional practice they use in helping students to learn. I tend to move towards the humanist worldview of learning and teaching, where knowledge is seen subjectively constructed. I have hard time believing in knowledge being measurable, objective or free of values. Data can be that, and some information may be objective, but those only become knowledge when they have been processed through our own experiences and understanding, i.e. personally constructed during the learning process. Also, learning can be so much more than just a change in one’s behaviour, as it is seen in the mechanist worldview! 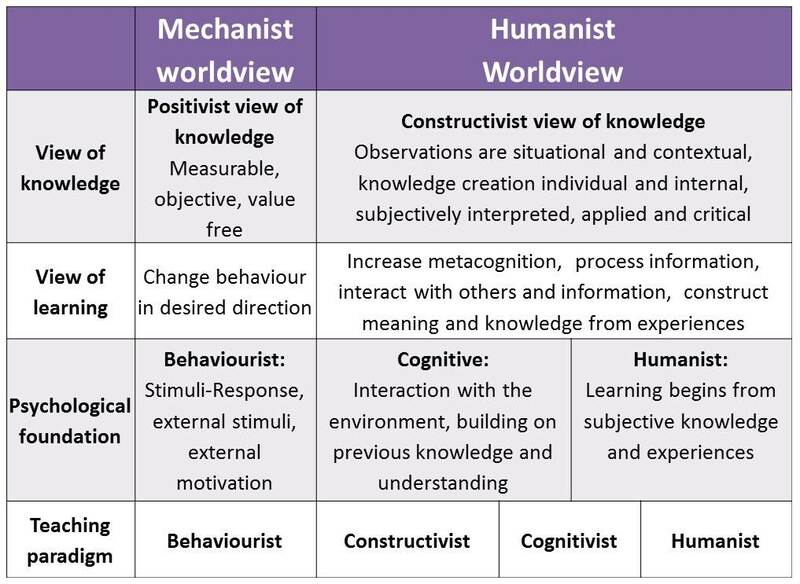 To fully support the learning process, and to improve students’ academic performance, it is important to combine all three teaching paradigms in the humanist worldview. The way I do it combines the cognitive and constructive practices in a cooperative learning environment. Cognitive practice includes helping students to learn about learning, but also becoming more knowledgeable of their own worldview, thinking and metacognitive skills. Constructive learning and teaching focus on collaborative meaning-making, gaining skills and understanding concepts. Cooperative teaching and learning build the emotionally safe learning environment, where interactions are held in high value, students can ask questions and engage in non-punitive assessments that support the learning process. Instruction that supports the learning process helps students to become skillful and nimble life-long learners. Skillful learners understand the past and are able to reflect on their own learning, but they are also able to adjust their knowledge to meet the requirements of the future. Biesta, G., & Tedder, M. (2006). How is agency possible? Towards an ecological understanding of agency-as-achievement. University of Exeter School of Education and Lifelong Learning, Working Paper, 5. While thinking of all my students – current, past and those in the future – there is one single wish I have for them all: to become a lifelong learner. Learning is an unending process that starts before we are born, and with the growth mindset it continues through our lives. Supporting that process is how I define my work, and I like to think that I contribute to my students’ academic learning as well as their growth as learners. Our students arrive to our classrooms with diverse skills and backgrounds, but they all have also common needs. We all benefit from having someone to facilitate our learning, someone to help us reflect what we have learned and thus guide the learning so that it becomes deeper. The simple word “learn” has very many connotations, so I want to define here that I am talking about transformational learning, and of that in the sense the learning being meaningful and relevant to the student. Learning is a multidimensional phenomenon, which makes it even harder to define. Learning is highly individual, situational (time wise) and context dependent. Of course all these components also interact – so every teaching-learning situation is unique. This presents the requirement for open and honest communication in learning situations, and makes learning facilitation a superior tool as compared to the traditional view of teaching as information sharing activity. Sincere communication is the foundation of excellent learning-teaching relationships. Asking open-ended questions is much more effective than being insincere and just pretending to ask genuine questions. Students do know the difference between a (fake) question we ask to test their knowledge and a (real) question we ask to hear their thoughts. We even listen differently to the answers to genuine questions (think of the difference between listening and hearing). Pretending to ask a genuine question when we already know the answer quickly erodes the trust and uniqueness of learning situation (I know this may be against some “questioning techniques” commonly taught during teacher training, but please bear with me), and when the deep connections have gone only shallow learning remains. In addition to questioning, insincere communication often aims to use unnecessary power over students (for example portraying learning as an external product instead of internal process, using extrinsic motivators, not sharing learning goal/objectives) and thus prevents the learning process from being as effective as it could be. True enough, in formal education learning is sometimes seen as a secondary goal, and performing (i.e. passing exams, getting good grades etc) as a primary goal, which of course shifts the focus from process to performance, and thus externalizes learning. 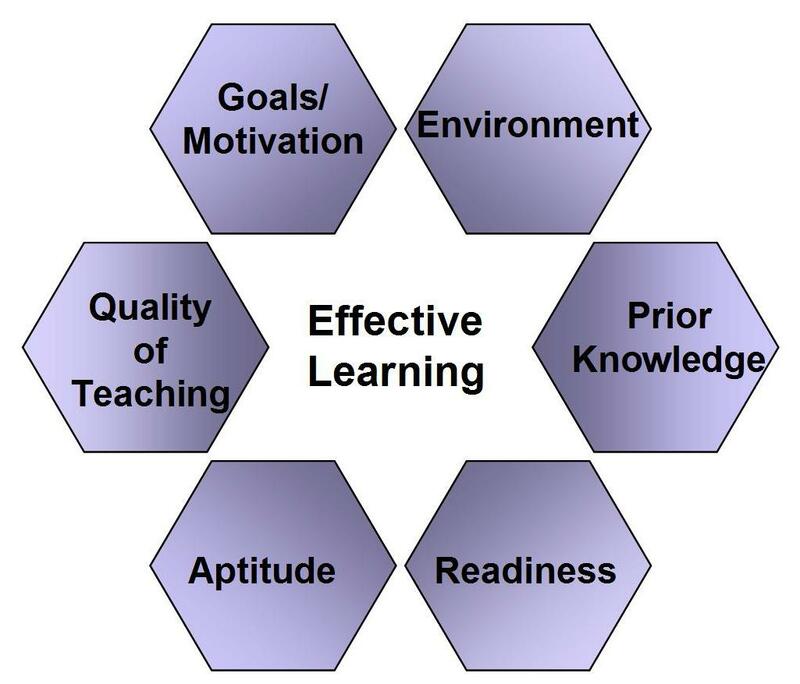 Teaching can be based on products, as we want to know that students have learned the bare minimum (usually defined as a learning objective/standards) and can also demonstrate it in exit assessment, but transformative learning – if we are lucky – continues long time after the student has left the classroom. This is why we should recognize how teaching/instruction is just one part of the learning process, and the other parts (goals/motivation, environment, prior knowledge, aptitude and readiness) need to be acknowledged with equal emphasis. Excellent pedagogical skill is is essential for teachers, because it helps balancing the products with the process. Learning cannot be confined to school or classroom, because the tools for learning are deeply connected to other parts of our lives. Communicating about the importance of continuous learning process empowers students to learn – where ever they might be. This is a known habit of successful students. To help all students achieve better learning results, we should be sure to communicate openly about learning being an intrinsic and internal part of students’ personality – not just something we do at school with the teacher. Nganga, C.W. (2011). Emerging as a scholar practitioner: A reflective essay review. Mentoring and Tutoring: Partnership in Learning, 19 (2), 239-251. Every child has a right to learn. This makes education a global issue. I am glad we are cooperating in educational research and making the latest information available for everyone via internet. In my mind this makes education more global as we become more aware about different practices around the world. Every teacher should be empowered to teach and to know they have choices. Comparing educational practices internationally may help us all to adapt better practices. I like to share the Finnish know-how of education, and while I am excited to see yet another study highlighting Finland as the best country in education, I am also hoping that the takeaways are much greater than just a simple ranking list. Having data is not important, but knowing what to do with it! No magic bullets – there are no quick fixes in education, long term joint planning is needed for sustainable education quality. Respect teachers – trust in your teachers and value them, because they are your professionals that schools cannot function without! Culture can be changed – find the positive elements in your educational culture and highlight them, then start building on that foundation. Parents are not the key – but they certainly should be your allies! We have a joint mission: student success. Educate for the future – empower students to learn. Focus education on how to learn and how to think, because that improves transfer to all other areas of education. I think these points are no news for people who are working on improving the quality of education around the world. It is very nice, though, to get additional affirmation for thoughts we have been posting and discussing about. The one very important message is about changing your culture. We often talk about students, how they are not clones and should not be treated like ones. Standards are not the solution. Educational systems have their distinctive characteristics, too, and thus global education must have a unique look in different countries, districts and schools. The paradigm change for educational quality must start at all levels of education – we cannot afford to wait for someone else to change first. Sometimes it is hard to find opportunities to choose. But, I refuse to believe there would be a classroom/school/educational system/country with absolutely no choices for students/teachers/administrators/policymakers to make learning more meaningful – the least we can do is to choose a “can do” attitude. How could your class/school/district be global and unique at the same time? What are your positive elements? The cognitive approach combined with the constructive and cooperative practices enable effective teaching and meaningful learning. C1 –Cognitive approach makes teaching and learning easy and effective. 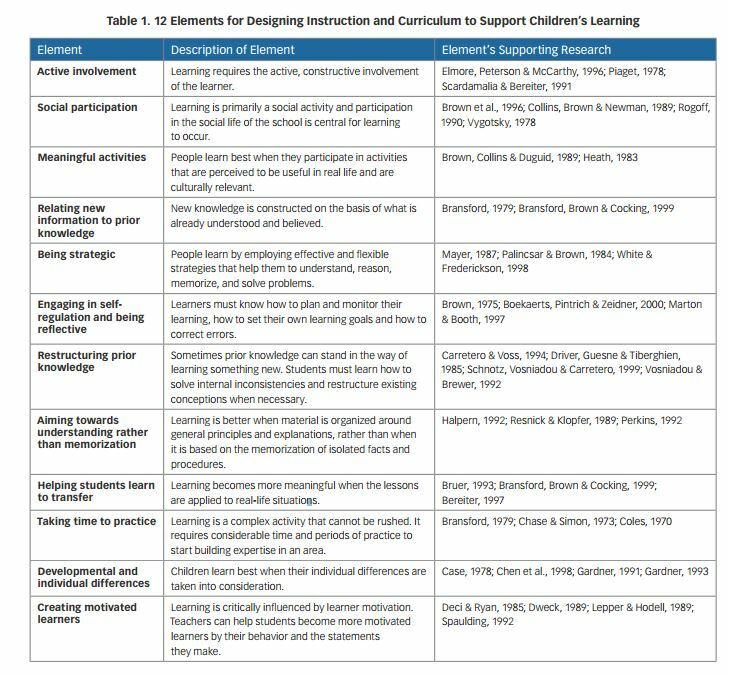 Viewing learning as a student-centered and dynamic process where learners are active participants, it strives to understand the reasons behind behavioural patterns. The individual way we approach learning and whether we believe in our abilities are huge processes that are running all the time behind student performance. This is why I believe it is important to build strong learners. C2 – Constructive practice emphasizes the students’ need to construct their own understanding. Delivered or transmitted knowledge does not have the same emotional and intellectual value. New learning depends on prior understanding and is interpreted in the context of current understanding, not first as isolated information that is later related to existing knowledge. C3 – Cooperative learning engages not only the whole student in her/his learning, but also the whole class (or school, or even a district!) into the learning process. Teaching and learning become meaningful for both teacher and students, because there is no need for the power struggle in the classroom: why would a student rebel against the rules s/he has been creating? Wide range of different teaching and learning strategies can be utilized, and there is much more time to teach and learn! Deep learning (or “syväoppiminen”, as I learned the term while studying for my M. Ed. in the University of Jyväskylä, Finland) helps brain to reconstruct the long-term memory, and stores the learned content quite permanently. Its counterpart, shallow learning, only stores learned items to our short-term memory and they get discarded after a while whey they are not needed anymore. Think of cramming for a remember-every-small-detail – type exam. The difference between these two types of learning is huge – one builds for life, other is for temporary use. And in educational settings we are always dealing with both types of learning. While reading about the “summer learning loss”, I cannot but think that those forgotten things were never deep learned. And because re-re-redoing things is extremely frustrating for both teachers and students, I wish more teachers intentionally chose how they teach and aimed for deep learning. 3Cs are one way of focusing on deep learning. They are easy to use and applicable in all levels of education – they are equally important in early childhood education as they are for people pursuing their masters or doctorates. Very few of us (humans) enjoy experiencing someone to use unnecessary power or control over us. How do you provide your students with meaningful learning experiences? An educator can never cease to learn – but what makes learning meaningful to us? We know how important (free) play is for children and how much it contributes to their learning – I think the dynamic way of play is the main contributor there (don’t have any data about this, but to me it seems like common sense: being able to control the play and make sense of the sensory feed related to it). And I assume that is what fascinates adult learners, too, the ability to connect ideas in a playful way. Every day we gain more information about how learning happens: with imaging techniques researchers are able to track what areas in our brain are active during learning. We know how each brain is different, and how learning is individual, and how different people manage and manipulate the knowledge in unique ways. How about teaching? Are we still using the same teaching methods that were common hundreds of years ago? Teaching and learning are like the two opposite sides of a coin – inseparable but opposite. We educators must learn to match our teaching styles with the dynamic view of knowledge, and find new ways for facilitating our students’ learning. Teaching is about communicating one’s own knowledge and understanding of the subject to students who either absorb it as is, absorb it with internal modifications, or discard it. Learning is about constructing a worldview. Facilitating students’ learning means helping our students to construct their own understanding of the subject, and negotiating the meaning of the words and concepts with our students until it makes sense to them. We teachers don’t like to have someone to come and tell us what to do. Very few students like that either. To have an effective educational system, we must understand that effective teachers are simply facilitators of students’ individual learning processes – and the ones who incite the spark of lifelong learning. Of course, if you have lost the passion of learning you cannot transfer that to your students either. Facilitating our own learning is the beginning. What do you need to do to find the old flame, and fall in love with learning again? It sounds like a fancy and complicated thing, this educational awareness, doesn’t it? Yet is is an everyday phenomenon, and often a hot topic of common conversations. We all have an idea about how to raise our children – or better yet, the neighbour’s children! We also have strong ideas and beliefs about teaching, because of the experiences we have had during our school years. Just like our beliefs about the best ways of raising children were partly developed during the time we were being taken care of. In the past these views of good parenting and good education were passed from mother to daughter, or within the community in general. I think we all should start looking for answers beyond our family traditions, or the ways “it have always been done”. Today we have more challenges in education and parenting, due to the globalization and free information available everywhere. But where to look and find the best practices? Fortunately we have tools to define good enough parenting – or good quality education. We also have tools to understand what these good practices look like. And this is what I am talking about while asking people to raise the educational awareness in their own communities: looking for practices that support development, learning process and understanding (as opposite of obedience, performance and memorization). There is lots of data available for us in print and on the internet, and we just should communicate about the best ways of supporting learning to people we meet in our everyday lives. For example there was a new study published today about how maternal support has an effect on our brain, in the regions that are essential to memory and stress modulation. http://www.pnas.org/content/early/2012/01/24/1118003109 The support I am talking about is seeing the positive in the child instead the negative. So, instead of paying attention to failure and saying negative things when students / children are misbehaving or unsuccessful we should try “catching” them in the moments of good behaviour, and just simply verbalizing the positive outcome. How could we communicate this to all the parents, teachers, grandparents, neighbours, and other people being involved with developing children? Will you help me tell people everywhere that children will learn better in school if they have been supported and nurtured in their early explorations within the safe structure of limits? Student centered and emotionally safe pedagogy is an attitude. It is not a handbook of tips and tricks, to help us survive our days. It is being physically and emotionally present when the student needs us. It is also thinking more about the process than the product. And in these classrooms the focus is in creating, not copying, no matter what the task is – this applies art as well as note taking! Emotionally safe classrooms are flexible by their nature and they have rules that are consistent and justified. Ordering other people arbitrarily around is only a way to show your power over them. Being considerate is generally understood as a virtue, and showing the same politeness to children does not go without rewards. Treating students as individual human beings sounds like basic courtesy to me. The central values of safety, co-operation, individuality, responsibility and building of realistic self image together create the foundation for an emotionally safe learning environment. 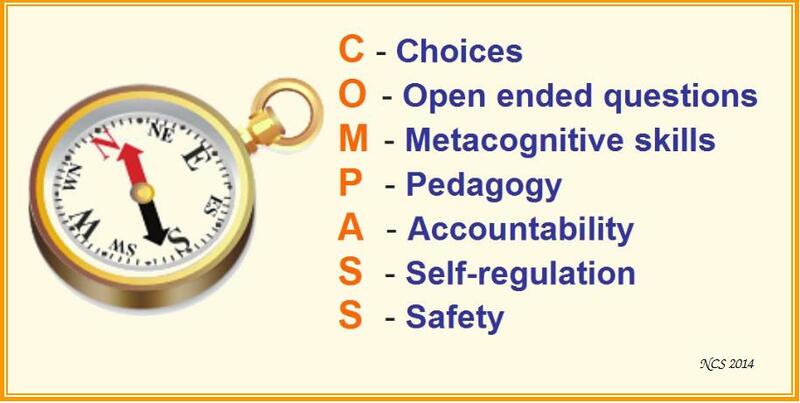 Most often these values are expressed in the classrooms and discussed with the students. Ideally the wording of the rules is co-operationally created, and confirmed with the signatures of the teacher and students, and then posted on the wall for further reference. Stress-free atmosphere is the first principle for creating an emotionally safe growing and learning environment. Creating the feeling of having enough time enables students to focus on their own learning instead of external factors that might disturb their concentration. Knowing that their thoughts and ideas are valued helps students think and express their thoughts more freely. More thinking equals more learning. The one situation when most of us feel threatened or unsafe is while we are receiving feedback. In an emotionally safe classroom the feedback becomes a natural part of the learning process, and thus stops being scary. While utilizing students’ daily self-evaluation and teacher’s verbal comments, the feedback system actually becomes a tool for the students to control their own learning. This system also automatically holds students accountable for their own learning and helps them realize how much they already have learned.